Currently on view at Pierogi Gallery in Brooklyn, Mark Lombardi: Index, presents an expansive, intimate portrait of the late artist’s life and work. 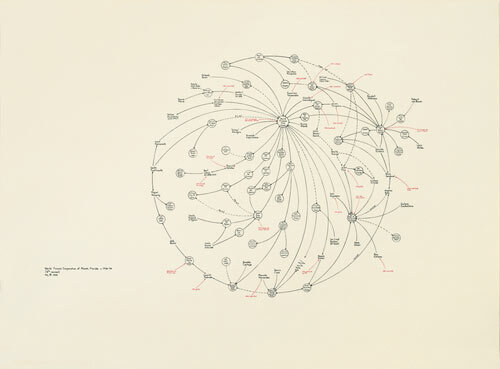 Lombardi is best known for his diagrammatic drawings that he referred to as “narrative structures,” and this show includes a selection of those works as well as preparatory and research materials, books from his reference library, and the sole video interview with the artist. Lombardi was making the diagrams of scandals, conspiracies, and power relationships long before he realized their visual potential. After studying art history in Syracuse, he moved to Houston, Texas to work as an abstract painter, archivist, and gallerist. He had always had a strong interest in politics and reporting, and that interest grew during this period. 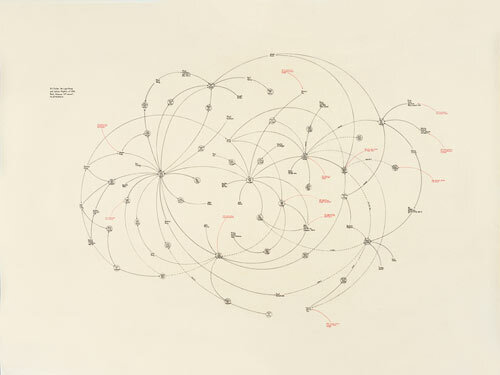 He started writing politically under pseudonyms, making the diagrams out of “pure necessity” to keep track of information and networks. At a certain point he realized that the drawings were potentially more powerful than straight written word, and began pursuing them as his sole storytelling device. The graphic impact of these works is something to behold. Many are large, and the neat, delicate, deliberate renderings deftly contradict the messy, involved topics they present. Some of the topics – the World Finance Corporation, the Vatican Bank, BNL Grain Trade, and Nugan Hand (to name a few) – are heady and convoluted, and don’t necessarily become anymore clear after viewing the diagrams. The real “wow” factor comes from seeing the artist’s painstaking process, and this is significant given Lombardi’s background as an abstract painter. There’s an obsessive, outsider quality to the work that is bolstered in this show through the presentation of this process. 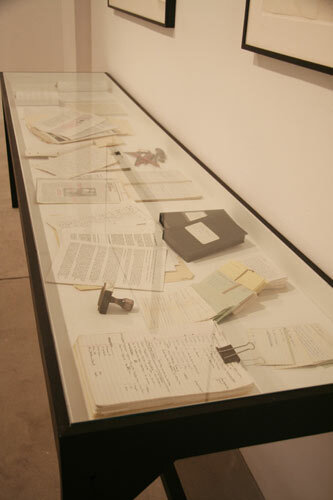 The reference books, as well as a vitrine filled with reams of highlighted articles, meticulous notecards, file folders, and other research ephemera, paint a portrait of Lombardi as an impassioned, devoted activist and journalist, and the intensity of his work is undeniable. The drawings take on a new profundity after viewing these items, especially when considering Lombardi’s restraint. 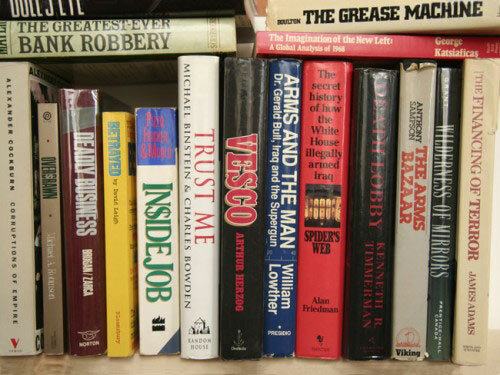 Viewing these materials, particularly the library of books, is a very personal experience. Across from them, the video interview plays, and as Lombardi speaks we see the same books stacked high on a shelf behind him. The video is short – maybe six minutes – and is loose, unpolished, and intimate. It’s difficult to witness Lombardi’s passion and commitment without feeling the same mystification over his suicide that his friends and colleagues expressed at the time. It’s also difficult not to speculate that this very passion was the catalyst for his death. Though it’s been suggested that other factors were at play, no one really knows for certain. For a rather private artist whose work is information-driven, this show achieves an emotional significance far beyond what one would expect. In a sea of context, the methodical, systematic drawings maintain their effectiveness as elegant structures but take on an additional identity, becoming monumental records of time spent, energy expended, and tremendous conviction.